Warren Buffett talks about building a moat around your business to make it untouchable. The strongest moat you can build is one based on strong relationships. Low prices can always be beaten. Stunning design ages quickly and can easily be copied. Impeccable uptime can be matched, and your features copied. 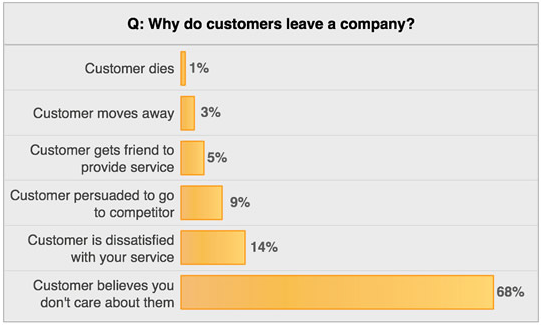 However, a good customer relationship is unique, and loyal customers are hard to steal. Great experiences are about getting everything right; it goes well beyond fancy sign-up forms, cute mails and game-ified tutorials. Sure, all those things help, but the customer experience has to be comprehensive. Quality is fractal. Your customers will judge your company based on all of the experiences they have with it, not just those dripping with CSS3 effects. Using a touchpoint matrix such as the one above will help ensure that you’re considering all of the experiences your customers will have. It’s almost never about price, because it’s so hard to change to a competitor (especially in SaaS software environments). If you start making decisions that are contradict what the customers want, you’ll lose them. Every touch point is important — from features you build to unparalleled customer service.